The use of the Calendar app on iPhone is great for organizing our day-to-day lives - whether it be a family member's birthday, a dentist appointment, or counting down the days until your holiday, it's great to have it all accessible in the palm of your hand. You can copy your calendars from your device's backup to your computer for safe keeping, using iBackup Extractor. From there, you can even transfer the calendar to another device! Download and Install iBackup Extractor using the button below. Select which backup you would like to access from the list of detected backups. Select the calendar you would like to extract, and click "Copy as VCard"(PC) or "Copy as iCal"(Mac). iBackup Extractor allows you to view and copy your Calendars stored on your backups. The instructions below also provide details on how to navigate the Calendars, and how to import iCal calendar files (Mac) to another iOS device. To view calendars in iBackup Extractor, click the "Calendars" icon in the category list. In iBackup Extractor, press the Calendar button in the categories list on the left. This will display the calendars stored in your device's backup. You can copy all of your calendars by clicking on the "Copy as VCard"(PC) or "Copy as iCal"(Mac) button in iBackup Extractor without selecting any individual calendar entries. To copy individual calendars, click on the calendar you wish to copy and click on "Copy as VCard"(PC) or "Copy as iCal"(Mac). By default, on Mac, your calendars will be saved as iCal files to your desktop. You will, however, be asked where do you want the save location for your calendars to be. You select which day, week or month you are interested in viewing by using the date picker on the left hand side of the Calendar manager. When you click on a date in the Date Picker the main calendar view will change to reflect your selection. 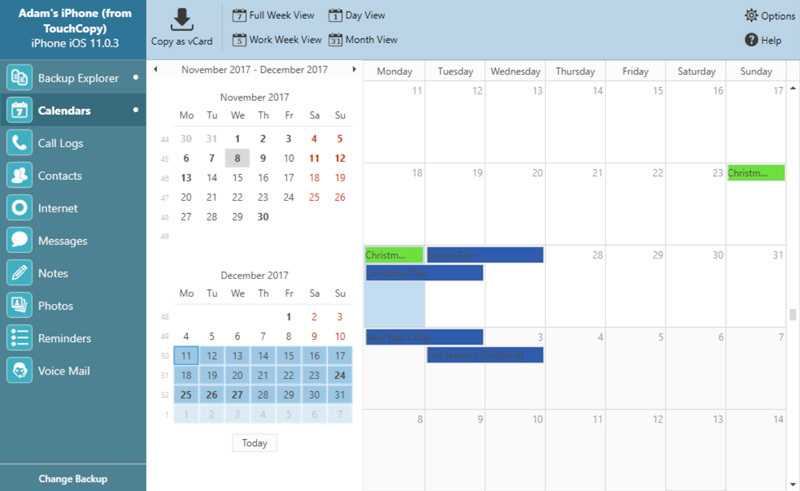 You can select to view your calendar in different ways. By Day, Working Week, Week or Month. You can change your preference by clicking on the appropriate button at the top of the main calendar view. Double-clicking on the iCal files saved by iBackup Extractor will automatically import them to your usual calendar manager such as Outlook. You can then use iTunes to sync these iCal files to another iOS device. Connect your iOS device to your computer, open iTunes and choose your device under DEVICES in iTunes. Click on the Info tab in iTunes and check "Sync Calendars with Outlook", and click on the "Sync" button. You may have instead copied your calendars directly to the inbuilt Mac Calendars app, in which you you can choose to sync this app through iTunes, rather than Outlook. Simply double-click on a VCard file saved by iBackup Extractor to automatically import it to your usual calendar manager such as Outlook. You can then use iTunes to sync these calendars to another iOS device. Connect your iOS device to your computer, open iTunes and choose your device under DEVICES in iTunes. Click on the Info tab in iTunes and check "Sync Calendars with Outlook", and click on the "Sync" button.